I'm the first to admit that I am an impulsive person (hey Aries), so when I went to Barnes and Nobel's website to shop for books (of course) and I saw that there was a new Nook released that very day, I just about lost it. I mean, I JUST wrote a post about ereaders singing the praises of my Nook Glowlight, and then a week(ish?) later there's a new latest and greatest to be bought? Needless to say after much (a couple of hours) deliberation, I bought it. See? Impulsive. But I had a duty, my friends. How can a book blog run without reviews of the latest technologies in reading? At least, that was the major point in my persuasive argument. :) Two days after I placed the order (overnight delivery is not always overnight delivery, jerks), that sucker was in my hands and on my Instagram. Yesssss. 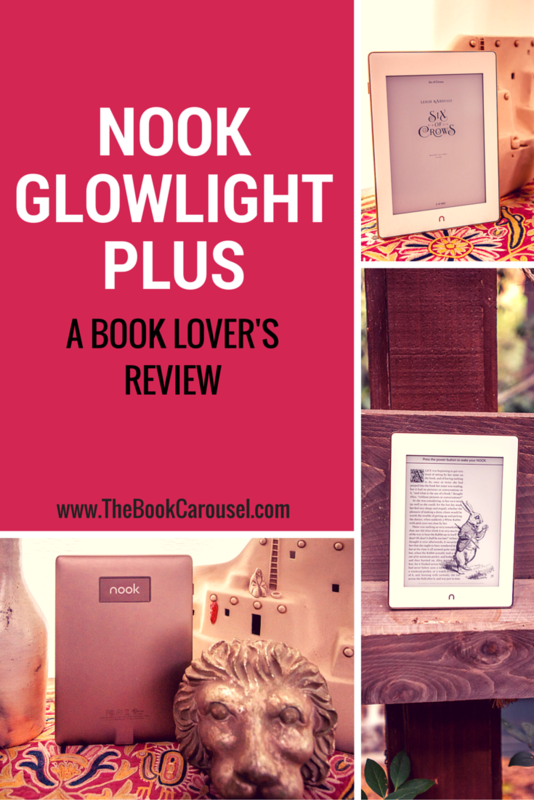 So what's so great about the new Barnes and Nobel Nook Glowlight Plus? Probably the most exciting feature (and one that I'm terrified to use) is the fact that it is waterproof. That's right, submerge that sucker and you're still reading. Technically you can read underwater for 30 minutes up to a meter, but I think you'll be all right if you just drop it in the tub. Which is more than you can say for a printed book. A comparison of the Nook Glowlight Plus vs the Nook Glowlight. Another thing that I love about the new Nook is probably superficial, but it is GORGEOUS. I've always been in love with rose gold and the new Nook is more of a purple gold, but it's so pretty. The aluminum case is a lot more substantial than the last Nook Glowlight, which was plastic with a rubber bumper for fall protection. Another visual plus is the higher resolution of the screen (300 dpi) and better contrast than the previous version. The screen is also fingerprint and glare resistant so it's more of a paper-like experience. 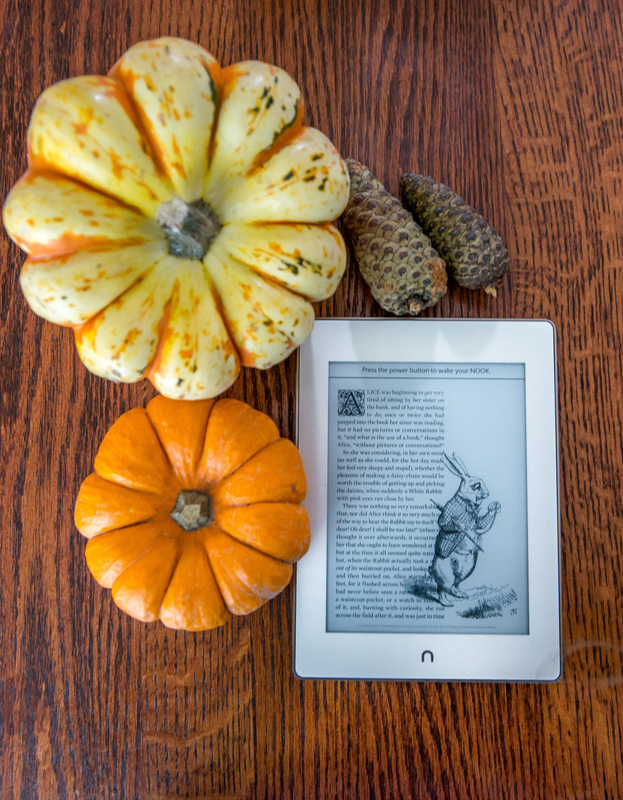 With all the great new features of the Nook Glowlight Plus, there are a few things that I would like to change. The first thing is the light is on all the time unless you intentionally turn it off. I can't imagine this is good for battery life, but if you're trying to track down your Nook in a dark room, it could be helpful. With the previous Nook Glowlight, you had to hold down the "n" button to turn on the light. Second, if you could adjust the sensitivity of the screen that would be great since sometimes you press the screen to turn the page and it flips two pages instead of one. Finally, and I haven't experienced this myself because I get my books from B&N, but there are some compatibility issues with Adobe files, so if you get your books from a library or other places that distribute in a PDF format, then you might have a bad time. All in all I am very happy with my purchase. I have already read through Six of Crows by Leigh Bardugo (loved it, BTW), and everything went smoothly. As much as I love #booktography, I will probably start to buy more books on my Nook just to use it more often.